RLJ Companies chief Robert L. Johnson has offered a solution to addressing alarming unemployment rates in the black community, calling for the creation of a "RLJ Rule," which would be modeled after the National Football League's "Rooney Rule." 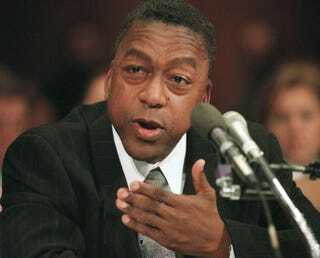 In an effort to engage the business community in addressing the inequitable unemployment rates for African Americans and to increase vendor and supplier opportunities for minority-owned businesses, Black Entertainment Television founder Robert L. Johnson, also founder of the RLJ Companies, is urging Fortune 1000 companies to "voluntarily" adopt a version of the Rooney Rule. According to the NFL, the Rooney Rule requires teams to give fair interviews to minority candidates whenever a head-coaching or general-manager position becomes open prior to making a final hiring decision. Since the inception of the Rooney Rule in 2003, the league has increased its head count to eight minority head coaches and five minority general managers. Johnson urges a similar practice for all U.S. companies and firms, which he calls the RLJ Rule. In making this statement, Johnson said, "The RLJ Rule is principally designed to encourage companies to voluntarily establish a 'best practices' policy to identify and interview the tremendous talent pool of African American managers and African American companies that are often overlooked because of traditional hiring or procurement practices." (b) encourages companies to interview at least two qualified African American firms for vendor supplier/services contracts before awarding a new company contract to a vendor. Johnson makes clear that the purpose of this voluntary rule is not to suggest quotas or that companies hire any individual or minority firm that is not qualified. Johnson notes that the RLJ Rule, if implemented properly, will further enhance a company's already established commitment to diversity and inclusion. Kudos to Johnson for coming up with a concrete strategy to address black unemployment and decrease the growing wealth gap between blacks and whites in this country. The Rooney Rule has been working in the NFL, slowly but surely, so an RJL Rule could accomplish the same for the mostly homogeneous business community. In other news: Thousands Attend Troy Davis Funeral in Georgia.